Model: This is a 5-part version with a length scale of 1:95. The train has a digital decoder and extensive sound and light functions. It also has controlled high-efficiency propulsion with a flywheel, centrally mounted in the "Bordrestaurantwagen" dining car. All 4 axles in both trucks powered by means of cardan shafts. Traction tires. The cabs in the end cars have interior details. The power pickup changes with the direction of travel and is always in the end car at the front of the train. The train has special close couplings with guide mechanisms. Triple headlights and dual red marker lights change over with the direction of travel, will work in conventional operation, and can be controlled digitally. The train has factory-installed interior lighting. The interior lighting is supplied with power from the continuous electrical connections for the entire train. Different color scenarios for the interior lighting can be controlled digitally. There is also cab lighting that can be controlled separately in digital operation. Maintenance-free warm white and different colored LEDs are used for all of the lighting. Both pantographs on the service car can be raised and lowered separately as a digital function. The minimum radius for operation is 437.5 mm / 17-1/4". Running the train on Radius 1 is also an option if you ignore the clearance gauge. Train length 151,5 cm. Digital decoder with extensive light and sound functions. The five (5) piece 22971 basic train can be extended with the three (3) piece 23971 add-on set and the additional 23972 intermediate car. 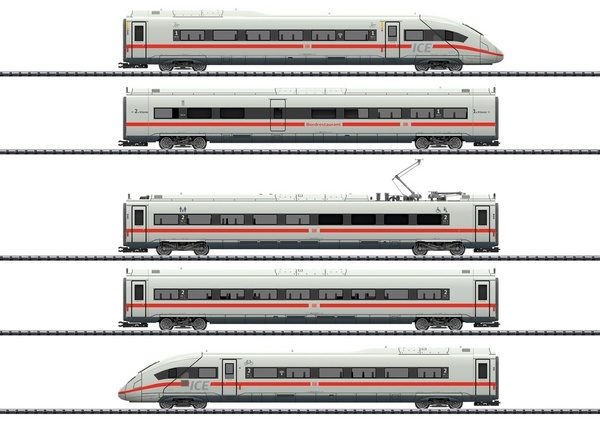 The basic train for the ICE 4 high-speed train can be found in an AC version in the Märklin H0 assortment under item number 39714.